"Go Pack Go" chants break out as Green Bay takes a 16-6 lead with second seconds remaining in the first half. Complain all you want about the officiating but Rodgers put that ball right in Griffen's midsection. He has to make that play. Terrible 1st half.Vikings were awful & so are the referees. 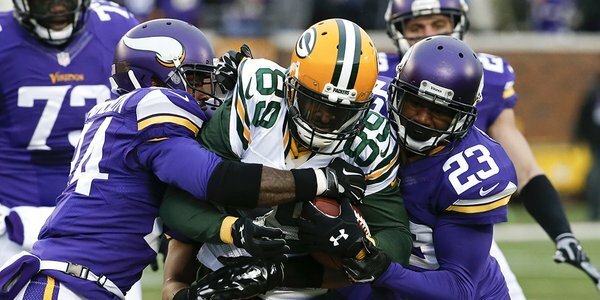 #Vikings entered as NFL's least-penalized team at 5.3 flags per game. Already at 6 for 85 yards before halftime. Bridgewater coming back in the game here for the Vikings. Good sign for Minnesota.
.@teddyb_h2o comes on the field, #Vikings have the ball at their 40 after the penalty. Bridgewater back in the game. 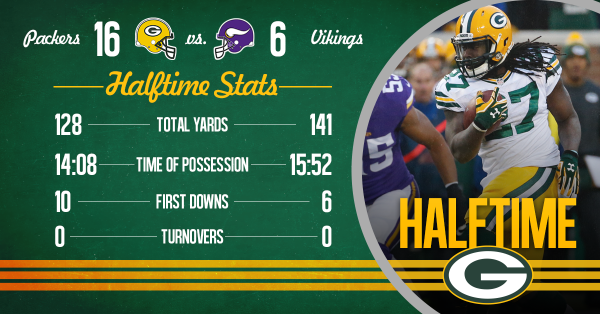 80 yards in penalties for Packers to zero for the Vikings. Vikings not looking ready for prime time. Teddy has to throw the ball down field. That 50 yard pass interference penalty never happens for Vikings because Teddy throws the ball out of bounce. 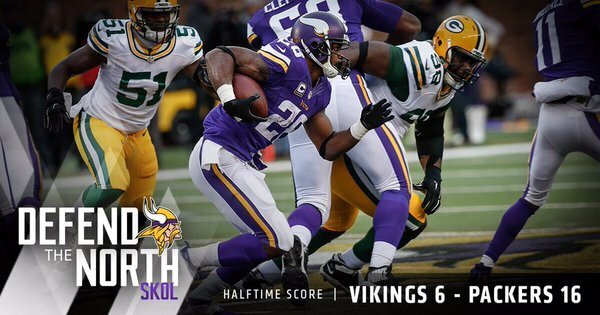 3 tackles and 1 sack for @captain_41 and 2 tackles and 1 sack for @EversonGriffen at halftime. In honor of @Russostrib attending today's game, I'd say the Vikings were holding the sticks a bit too tight in that opening half. 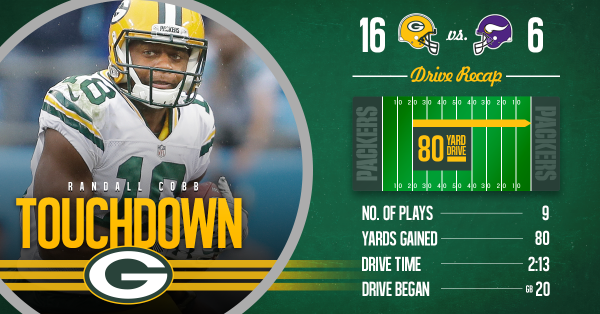 #Packers will receive the 2nd half kickoff. Would you rather @thesuperstar68 & I talk #Vikings on Vent Line or preview Survivor Series?
. 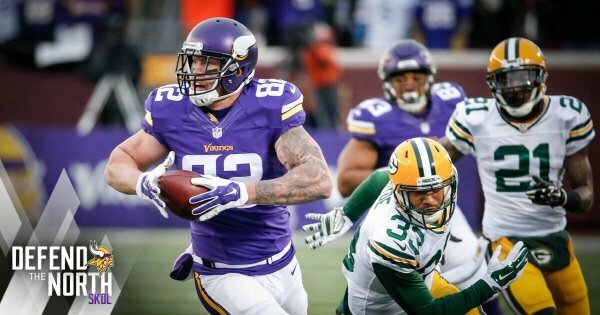 @kylerudolph82 's 47-yard TD catch was the longest of his career. Sharrif Floyd walks off the field after getting up slowly. #Packers DB Micah Hyde and C Corey Linsley are downgraded to OUT. Consecutive throws where Rodgers' target isn't looking for ball. Bring FG unit on. 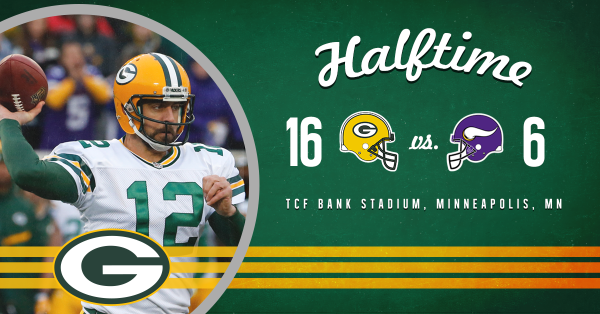 #Vikings trail 19-6, biggest deficit in a second half since season opener in San Francisco.